Describe the effects (on patients and on physicians) of physicians' empathic responses to strong emotions, as well as the effects of ignoring strong emotions. Identify likely origins of strong emotions. Describe how clear personal boundaries promote clinical effectiveness and professional growth. Demonstrate ability to respond empathically to strong emotions. Describe situations that may require referral or medication as adjunctive responses to strong emotions. Disclosure	 Dr. Egener has no commercial relationships to disclose. Dr. Gilligan has no commercial relationships to disclose. Dr. Clark has no relationship to disclose. Dr. Novack has no relationship to disclose. Dr. Saizow has no relationship to disclose. Commercial Support None; This project was made possible through the generous support of the Arthur Vining Davis Foundation. Unlabeled Uses Each faculty person presenting is requested to disclose any product that is not labeled for the use under discussion or that the product is still investigational. There are no off label uses. During the medical interview patients' strong emotions tend to elicit strong emotions in their clinicians. Depending on clinicians' skill and self-awareness, those emotions can lead to productive exploration of important clinical issues, or they can threaten therapeutic relationships. This module will describe concepts and skills that help you to respond to patients' intense expressions of sadness, fear, or anger in ways that not only promote patients' healing, but also enhance your own self-awareness and growth as a clinician. When your patients are feeling anger, fear or sadness, are you usually aware of this or are you sometimes caught off guard? Which circumstances make you more aware, and which circumstances tend to cloud your awareness? How do you feel when patients get angry with you? How do you respond? When patients demonstrate strong emotions, which of your responses tend to help strengthen your relationship with them? Which tend to escalate discomfort in the room? In your non-medical life, are you more comfortable with fear, anger or sadness? Which tends to cause you the most discomfort? How do you determine whether you need specialty consultations with patients who are emotionally distressed? When do you consult your peers? Strong emotions are normal when facing illness or injury, a natural human response to life-changing events, and as predictable as getting wet after jumping into the ocean. Respond to patients’ strong emotion with empathic statements and gestures; they will strengthen the clinical alliance and promote healing. Your patients will think that you do not understand their experience, or that it does not matter to you, if you try to “fix” their strong emotions. Strong emotion needs your empathic response, not "fixing". Strong emotions can originate in the patient or the clinician, or originate from their interactions. Identifying the origin of emotions promotes clear boundaries and enhanced clinical effectiveness. Taking time to explore your responses to patients' emotions promotes personal and professional growth and therapeutic competence. Demonstrate the ability to respond to patients’ emotions with empathic statements. Name, Understand, Respect and Support (NURS) are reminders of some effective examples. Describe the effects (on patients and on clinicians) of clinicians' empathic responses to emotions, as well as the effects of ignoring emotions. List typical origins of strong emotions. Describe how maintaining clear personal boundaries promotes clinical effectiveness and professional growth. Prompt verbal and nonverbal acknowledgment of emotions, particularly the strong emotions of anger, fear and sadness, builds trust and strengthens relationships. Emotions are always present in healthcare encounters, because health and illness are emotionally charged issues. On the one hand, emotions are not good or bad, but simply facts, like the weather. On the other hand, learning to perceive patients’ emotions and to elicit and respond to them are critically important clinical skills. Often we notice them, but sometimes we do not. Perhaps we are too caught up in an interaction to track patients’ emotions or are distracted by trying to make a diagnosis or develop a treatment plan. Sometimes we only recognize or respond to patients' emotions (or our own emotions) when we look back on interactions or notice the residual impact on ourselves. Increasing our awareness of our own emotions helps us avoid reacting to them in counterproductive ways.. Increasing awareness of our patients’ emotions opens opportunities to understand patients better and to express our care for them. If we do not notice patients’ emotions, they may feel that their experience is invisible, that they as people have not been seen. Empathic responses demonstrate your active interest in understanding patients’ experiences, their hopes and fears. Every patient is suffering, a little or a lot, and empathic responses to their emotional cues, clues and statements not only lessens the suffering, but encourages them to participate productively in diagnostic and therapeutic decision-making. The strong emotions of sadness, fear and anger each originate in the experience or anticipation of loss - for example loss of function, life, relationship or independence. Exploring your emotions that arise in patient care promotes your professional growth. Most of us are sensitive to certain emotions and less sensitive to others. You can become a more effective clinician by being more aware of your own "hot buttons" and "blind spots." Studies in social and biological sciences as well as extensive commentary in literature, philosophy and the arts make it clear that human beings are wired for empathy and that without this wiring we would not survive. Seeking to comprehend patients’ emotional experience helps us overcome the feeling that patients are a challenge. It helps us to feel that our patients and we are together on the same side of the table, facing the challenges of their experience on the other side. Empathic responses show that we understand that the illness is the problem, not the patient. Distinguishing between the patient’s behavior and the patient as a person creates professional objectivity, whereas seeing the patient as the source of our discomfort can make a therapeutic alliance difficult. Our caring instincts are kindled when we see patients’ sadness, anger or fear as an expression of their suffering rather than the source of our own unpleasant feelings. When we respond empathically to patients’ emotions, we make a therapeutic intervention of fundamental importance, one which enhances healing as well as patients’ capacities for hope and for taking effective action. You do not need to actually feel what patients are feeling in order to be therapeutic. The interview itself can become a healing experience because being understood is therapeutic. Data from many sources within medicine, across diverse cultures and in fields such as psychology, education and the arts demonstrate that when we fail to respond to strong emotions in an empathic manner, patients feel they are not understood or not cared for by the listener, or worse, not valued as persons. You show interest in comprehending patients’ emotions and experiences by making empathic statements that acknowledge those emotions or experiences. Your empathic responses communicate and demonstrate that you care about patients’ experience and your interest builds trust and safety into the relationship. In turn, trust helps patients join with us both to explore their illness stories and to generate therapeutic options more efficiently and effectively. To be sure, people debate about how much emotional connection between patients and clinicians is optimal. Too much detachment risks loss of rapport, but “getting too close” or losing one’s boundaries causes a loss of therapeutic agency. However, when we do experience emotion in a patient encounter, it is useful to become curious about why this is so (see "Professional growth" below). Empathy skills are the same in simple situations and in emotionally intense ones. Many learners worry that the purpose of empathic responding is manipulative, an attempt to maneuver patients into another state or perspective that the clinician desires. Unequivocally, this is not the case! The purpose is to express authentic caring and to forge a genuine therapeutic relationship with patients by building alliance, safety and trust that will benefit them. Staying in relationship lessens the isolation patients inevitably experience when they face health problems. Our effort to imagine their circumstances and their experience conveys the authenticity and depth of our investment in their well-being. Patients cannot infer empathy from their clinicians and need to hear empathic statements spoken aloud. Nonverbal gestures may not be sufficient in the usual healthcare settings, unless relationships are solidly established as trustworthy. Clinicians powerfully signal their genuine concern when they respond to emotion with empathic statements. This is most emphatically true when pain is significant, whether it is physical pain or psychic distress, or when diagnosis is elusive or treatments are of uncertain efficacy. All DocCom Module authors stress this dynamic and the fundamental importance of relationship building to successful healthcare outcomes. Nonverbal empathic behaviors are also critical, but may not be sufficient in the usual healthcare settings, unless relationships are solidly established as trustworthy. By the same token, empathic statements accompanied by non-empathic body language will generally be perceived an inauthentic. Clinicians powerfully signal their genuine concern when they respond to emotion with empathic statements supported by empathic nonverbal behavior. This is most emphatically true when pain is significant, whether it is physical pain or psychic distress, or when diagnosis is elusive or treatments are of uncertain efficacy. All DocCom Module authors stress this dynamic and the fundamental importance of relationship building to successful healthcare outcomes. The need for clarity during discussion of the complex biomedical aspects of illness often distracts clinicians from responding to patients’ emotions. Two mnemonics can help clinicians find words with which to respond in stressful situations where complicated or urgent biomedical features are prominent. NURS and PEARLS help learners to remember various effective empathic statements that build trust and relationship. The mnemonic NURS includes Name, Understand, Respect, and Support, while PEARLS includes Partnership, Empathy, Appreciation (and Apology), Respect, Legitimation and Support. We present specific examples of empathic statements in brief clinical vignettes in the pages below. Whatever your words, and however awkward or unskilled you feel, if you are genuine in your intention to comprehend and appreciate patients’’ situations, your attempts will be helpful. Many learners initially feel that these responses are faked, foreign or phony, but in the context of improving interview skills they find the mnemonics to be extremely useful. It is important to remember that the goal is not to act as if you care, but rather to show the patient that you do care. Any skill is initially awkward - think of your first time dribbling a basketball, playing a musical instrument, or speaking a foreign language. Increasing the range of situations in which you can respond with empathy is a process that is essential throughout your career, from student to seasoned clinician. Both beginning and advanced clinicians report that feedback from their patient interviews convinces them that practice with NURS / PEARLS eventually results in greatly improved relationships. More practice enables them to respond to emotions in a nuanced and increasingly effective and personalized manner. As with suturing, reading x-rays and many other zmedical tasks, performance improves with practice. The illustrations in this module are informed by evidence-based sources. Whatever your words, and however awkward or unskilled you feel, if you are genuine in your intention to understand, your attempt will be helpful. 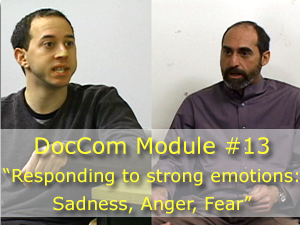 First, your empathic non­verbal cues (DocCom Module 14) will be apparent to patients. Second, if you are misunderstood, patients are likely to give you another chance to clarify and express your caring, either by telling you directly or sending nonverbal signals of perplexity. If your goal were to manipulate, the skills would be inflammatory; if your goal is to communicate genuine interest and feelings, no matter how awkwardly expressed, patients are likely to be appreciative. The emotions of sadness, fear and anger have origins in the experience or anticipation of loss. In sadness, the patient experiences directly the discrepancy between a desired and an actual state. In fear, the patient confronts the agent of an anticipated loss. What do we know about the biology and functions of empathy? Our reasoning is governed by our emotions and desires much more readily than our emotions and desires are controlled by logic or rationality. We consider ourselves rational beings, but human behavior is often driven more by emotion than logical thought. And when people are in highly emotional states, their ability to use cognitive reasoning is compromised. Expressions of empathy, both verbal and nonverbal, and of an authentic desire to understand people who are experiencing strong emotion are the most effective ways to connect with them..
People and other primates have evolved the capacity to “read” others’ emotions, a fact that implies that empathy provides a survival advantage. Research in wild chimpanzees demonstrates advantages to the ability to read emotions, as well as disastrous social consequences of the inability to do so. Other research indicates that complex neurobiological mechanisms and neuroendocrine activation underlie the phenomenon of empathy. In the brain‘s cortex "Mirror neurons" register another person’s behavior and allow people to imaginatively experience that observed experience. In fact, “emotional intelligence” (EQ) may correlate better with job and marital success than intelligence quotient (IQ). Awareness of emotions and their recognition in other people confers the power to react mindfully, rather than reflexively. Thoughtful and empathic responses are productive for patients and satisfying for clinicians, whereas reflexive responses usually retard rapport and limit healing. One way of understanding this is that an empathic imagining of what a patient is going through and active expression of this empathy allow us to stay with patients where they are emotionally. In contrast, our reflexive reactions tend to be responses designed to guide us away from emotion because we find strong emotions uncomfortable. The patient cries, we find it uncomfortable to witness their distress, so we reflexively try to “help” them stop crying rather than remain present with them in their grief. Exploring your own emotions that arise in treating patients promotes your professional growth. Most of us are very sensitive to some emotions, and less sensitive to others. You can be a more flexible and effective clinician by becoming more aware of your own blind spots and "hot buttons". Clinicians may resonate with patients’ anger or sadness and thus feel the same emotion. Or a patient’s emotion may evoke a different emotion in a clinician, e.g., patient sadness may induce clinician anger. Also, a clinician may experience an emotion when the patient is not manifesting any emotion. The range of responses to patients is as rich as the diversity of human experience, upbringing, culture, and personality. While our own emotions may provide clues to what the patient is feeling, there is nevertheless a differential diagnosis of clinician emotion – just as the emotions may have many sources in the patient, the same may be said of the clinician. These factors combine to attune us differently to emotions – there is no “correct” or “best” response. Exploring emotions enables accomplishment of all the major functions of the medical interview: data gathering, relationship-building and collaborative planning for diagnosis and treatment. Giving the patient control over whether and how to discuss the emotion will also give the patient some control of the emotion. Anger is a normal response to injury, loss or a perceived threat but often alienates those who might help.. Experiencing illness can precipitate fear. Studies have shown that addressing emotions helps shorten interviews and builds trust, in both surgical and primary care visits. Unfortunately, clinicians commonly disregard emotions. Sometimes clinicians think they lack the skills to manage the flow and timing of the interview, and sometimes they cannot shift their focus from biomedical aspects back to the person. The timesaving effects of acknowledging emotions lie in enhancing patients’ trust in their clinician. Skillful use of patient centered skills allows clinicians to integrate caring for the person with caring for the biomedical diagnostic and therapeutic goals. Patients who see that their communication of important personal needs, values, concerns and beliefs is welcomed by clinicians are more likely to cooperate and partner with clinicians in discussing, planning and carrying out diagnostic and treatment plans. Of course clinicians use judgment in deciding how to respond to emotions when they arise, but choosing not to explore strong emotions will hamper the therapeutic relationship. Regardless of the clinician’s intention, ignoring patients’ feelings creates the impression that the clinician does not care about the emotions or considers them not important. Patients may feel that the clinician has failed to perceive their experience and their suffering. This perception diminishes the clinician’s therapeutic effectiveness (DocCom Module 3). Giving the patient control over whether and how to discuss sadness will also give the patient some control of the emotion. Let’s look at an example using the mnemonics. Sadness may be non-verbally apparent when a clinician approaches the patient’s bedside or enters the patient’s room. A patient may be crying, withdrawn or staring at the floor. The clinician cannot initially know whether these gestures relate to a health concern, a social issue, depression or something else. Thus it can be empowering for a clinician to simply Name the apparent emotion. Some explanation will follow. When the clinician has some notion of the cause, Understanding, Rspecting (or Legitimizing) the patient is the appropriate next step and demonstrates the clinician’s willingness to understand the reason for the emotion. Here are some statements that illustrate use of the skills of Respect, Understand and Legitimize. Support / Partnership statements align the clinician with the patient, emphasizing that the two are on the same side and working for a shared goal of improved health. When talking with someone who is angry, the most effective strategy for navigating a way forward toward a more productive dynamic is to acknowledge and try to understand their anger. Anger is a normal response to an injury or perceived threat and can be counter-productive when it alienates those who might help or unnecessarily escalates a conflict. Many of us have difficulty responding in a productive manner to anger due to our fear of escalating anger, conflict and potential retaliation. This fear can lead to defensive statements or questions which have the undesired effect of increasing the other person’s anger. Ignoring their anger, changing the subject or trying to persuade them not to be angry tend only to escalate the anger. Remember: you can express your understanding without agreeing with the other person. 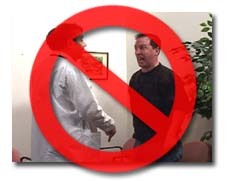 Click the picture above to see a movie portraying poor communication with an angry patient. Click the picture above to see a movie portraying better communication with an angry patient. One challenge of anger is balancing empathy with enough “detachment” to remain professional. The patient’s anger may not be directly towards us personally, but feeling personally attacked can make us defensive. And responding in a defensive manner - “You did not hear what I said” – usually worsens the situation, because it implies that the other person is at fault, somehow. Sometimes it helps to remind ourselves that although patients’ anger may be directed at us, its origin lies in the patients’ circumstances. In other words, the anger is usually not about us and we’re not responsible for the patient’s anger or for “fixing” it. However, we do help patients when we take the time to become mindful of their pain or loss and genuinely attempt to make an empathic statement despite feeling attacked. If patients continue to be disruptive, it’s best to disengage. Continued discussion usually only “fuels the fire.” It is appropriate to leave the room, to hang up the telephone or to call Security. Your own safety takes precedence over being therapeutic. Your own gut feeling about personal safety is generally reliable, and being attuned to a sense of danger is but another aspect of self-awareness. Exhibitions of extreme anger are unusual and may signal other feelings or diagnoses. For example, intense anger may be a way of insulating oneself from intense fear, such as that presented by a lethal diagnosis or a threat to one’s child. Anger that might have been more moderately expressed can be disinhibited by alcohol and other drugs. Personality disorders and delusional thinking can manifest as extreme anger, so such demonstrations should prompt consideration of substance abuse, sociopathy or schizophrenia. Medical events such as a motor vehicle accident or a worsening clinical situation precipitate intense fear. Assist patients who experience fright by helping them bring fears into the interview where you can show your understanding. Resist invoking false reassurance – on the one hand, the falsehood usually helps only minimally, and on the other, trust is jeopardized and the therapeutic alliance is undermined when the falsehood is uncovered. That alliance is what provides the leverage for supporting patients. However, you should never diminish hope, even when death, the most dire outcome, is certain. Hope is available in the manner or management of dying, in spiritual domains and in the people and accomplishments left behind. Your initial response to concerns patients name should be to make an empathic statement. Sometimes simply Naming the fear or hearing that particular concerns are Understandable/Legitimate rather than extraordinary, diminishes fear. If uncontrolled pain is the concern, Understand this, and reassure them of the effectiveness of and access to medication. If spiritual concerns are the issue, Understand this, and suggest consulting appropriate pastoral services. Often a lack of control over future events, or the idea of facing the unknown alone drives the intensity of fear, so taking any positive action, such as assuring patients of your Support can confer a sense of control. Fear becomes paralyzing for some patients, preventing them from making constructive steps. While the psychobiologic consequence of fear, anxiety, can mobilize a patient to prevent or mitigate a feared event, severe anxiety may require psychiatric consultation or medication. If appropriate, a benzodiazepine can give the patient relief and a sense of control. (DocCom Module 26) Remember to screen for alcohol or other substance abuse before you offer this option. All caring professionals live with feelings of isolation, guilt, inadequacy and uncertainty, at least occasionally. No clinician is immune to the experience of patients’ suffering and death that bring us to confronting our own existential fears. In everyday patient care, you also bump up against your own limitations, which can precipitate a professional crisis. Many clinicians in certain specialties encounter these challenging issues every day. Reflect on these issues with colleagues in order to bring fears into the open and prevent burnout. (DocCom Module 4) Remember to share feelings with your colleagues and your team; their listening will help you at the same time it helps them. Patients regularly confront both real and apparent life-changing medical events that threaten them with a loss. Every day clinicians will regularly encounter their patients' fear, sadness and anger, as well as their own emotional responses. Emotions are neither good nor bad – they are simply facts, like the weather. However, patients and clinicians can become stuck in strong emotions and overwhelmed by their force. At these times we must maintain our professional equilibrium and use the skills that we have practiced (in less challenging circumstances,) particularly empathic ones that communicate interest in the patient as a person. NURS and PEARLS statements serve as reminders of simple, clear and effective empathic responses for most situations. The intensity of emotion-charged moments generate proportionately strong and rewarding relationships with patients, who will benefit greatly from experiencing your attention, empathy and compassion. Such events present important professional challenges while simultaneously engendering personal and professional growth. Lorie A, Reinero D, Phillips M, Zhang L, et. al. Culture and nonverbal expressions of empathy in clinical settings: A systematic review. http://dx.doi.org/10.1016/j.pec.2016.09.018. Cameron R, Mazer B, Deluca J et. al. In search of compassion: a new taxonomy of compassionate physician behaviors. Health Expectations. 2015;18:1672-85. Back A, Arnold R. “Yes it's sad, but what should I do?” Moving from empathy to action in discussing goals of care. J Palliat Med. 2014;17:141-144. Salmon P, Young B: Creativity in clinical communication:From communication skills to skilled communication. Med Educ 2011;45:217–226. Fan Y, Duncan N, de Greck M, et.al. Is there a core neural network in empathy? An fMRI based quantitative meta­analysis. Neurosci Biobehav Rev. 2011;35:903–911. Back A, Bauer-Wu S, Rushton C, et.al. Compassionate silence in the patient-clinician encounter: a contemplative approach. J Palliat Med. 2009 Dec;12:1113-7. Frankel R. Empathy research: a complex challenge. Patient Educ Couns. 2009;75:1­2. Egener B. "Empathy" in Behavioral Medicine: A Guide for Clinical Practice, third edition. McGraw-Hill, 2008,10­17. Coulehan J, et. al. “Let me see if I have this right…”: words that help build empathy. Ann Int Med. 2001;135:221­227. Quill T, Arnold R, Platt F. “I wish things were different”: expressing wishes in response to loss, futility and unrealistic hopes. Ann Int Med 2001; 135:551­555. Levinson W, Gorawara-Bhat R, Lamb J. A study of patient clues and clinician responses in primary care and surgical settings. JAMA. 2000;284:1021-1027. Tim Gilligan, M.D., Barry Egener, M.D. Dennis Novack M.D., Bill Clark M.D., Ron Saizow M.D.